In June 1892, a thirty-year-old shoemaker named Homer Plessy bought a first-class railway ticket from his native New Orleans to Covington, north of Lake Pontchartrain. The two-hour trip had hardly begun when Plessy was arrested and removed from the train. Though Homer Plessy was born a free man of color and enjoyed relative equality while growing up in Reconstruction-era New Orleans, by 1890 he could no longer ride in the same carriage with white passengers. Plessy’s act of civil disobedience was designed to test the constitutionality of the Separate Car Act, one of the many Jim Crow laws that threatened the freedoms gained by blacks after the Civil War. This largely forgotten case mandated separate-but-equal treatment and established segregation as the law of the land. It would be fifty-eight years before this ruling was reversed by Brown v. Board of Education. 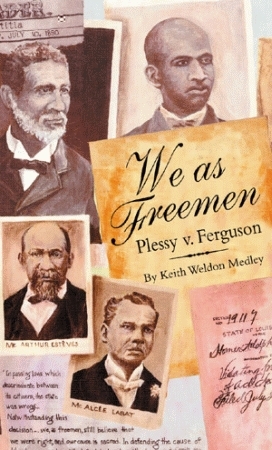 Keith Weldon Medley brings to life the players in this landmark trial, from the crusading black columnist Rodolphe Desdunes and the other members of the Comité des Citoyens to Albion W. Tourgee, the outspoken writer who represented Plessy, to John Ferguson, a reformist carpetbagger who nonetheless felt that he had to judge Plessy guilty. Keith Weldon Medley was born in New Orleans and grew up in the Faubourg Marigny, not far from where Homer Plessy lived. He attended St. Augustine High School and graduated from Southern University in New Orleans with a BA in sociology and psychology. A two-time recipient of publication initiative grants from the Louisiana Endowment for the Humanities, Keith Weldon Medley has published articles in American legacy, Louisiana Cultural Vistas, New Orleans times-Picayune, and other periodicals. We as Freemen is expanded from an article Mr. Medley wrote for Smithsonian. Click here for the Introduction. Click here for Chapter 1. Click here for Front Matter.